NOTE: The CDC class functionality has now been incorporated into the SERIAL software. No further development will be done on the CDC software. The USB communications device class (or USB CDC) is a composite Universal Serial Bus device class. It is used for modems, mobile phones, two way radios and many other generic serial devices. This is for transmission TO the attached USB CDC device. The baud rate for communication with the board. Note that this does not effect the communications speed with the attached device. This determines whether data sent to the board is echoed back by the board. This is useful when initially testing communication using a terminal program to issue commands. This determines the type of communication with the CDC device. This is for transmission TO the attached USB CDC device only. Data FROM the CD device is not affected by these settings. Similar to byte mode, but data is sent once a complete packet of data is received. This is useful for binary data transfer. The first byte of the packet data is the data length (excluding itself). This is not transmitted. The packet of data is transmitted once all data bytes have been received. You can now set the serial port to RS232 negative logic (local - not the attached USB device). 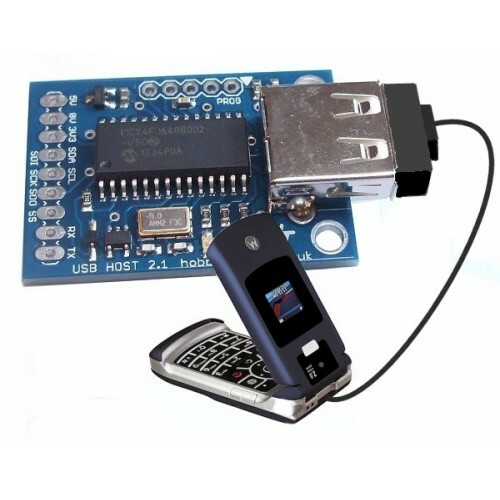 This will enable you to connect the board directly to serial ports that support the RS232 negative logic format. All modern smartphones. That includes iPhones, Android, Blackberry. These phone use a proprietory communication system and will not work. The USB Host Board will also charge your phone while it is plugged in so no worries about the battery going flat. First test communication by issuing the AT command. The mobile phone will normally echo the command sent and then send an OK response. E.g. To send an SMS message we use the AT+CMGS command to indicate the phone number to send the text to. The phone will respond with a > prompt. We can then send the text part of the message. Carriage returns sent will genereate another > prompt on a new line.